Even though it commonly occurs, something that is by no means widely realised is the appearance on certain websites of cryptozoological news reports that initially seem to be extremely significant and exciting but which in reality are invariably and completely fictitious. The 'certain websites' that I am referring to here are so-called satire news sites, of which there are a sizeable number, and which to the casual eye appear to be genuine, factual news websites, but whose entire content, regardless of subject matter, is actually pure fiction (although the images used in them have sometimes originated in earlier, unrelated factual stories on genuine news websites). To be fair, I freely concede that most of these sites do include a small but readily visible disclaimer, usually at the top or bottom of their front page, which when clicked states categorically what they are and what their stories are. Unfortunately, however, these disclaimers are frequently overlooked by readers, as a result of which many fake stories of a cryptozoological nature that have originated on satire websites subsequently make regular and repeated appearances on bona fide cryptozoological sites and social website pages. Posted there by crypto-enthusiasts unfamiliar with satire sites, they often generate a great deal of conjecture and confusion until their true nature is revealed by more experienced web-surfers. "World News Daily Report is a news and political satire web publication, which may or may not use real names, often in semi-real or mostly fictitious ways. All news articles contained within worldnewsdailyreport.com are fiction, and presumably fake news. Any resemblance to the truth is purely coincidental, except for all references to politicians and/or celebrities, in which case they are based on real people, but still based almost entirely in fiction." * Mysterious Remains of a Whale Found in a Field in Utah. * Smithsonian Admits to Destruction of Thousands of Giant Human Skeletons in Early 1900's. Mexican Drug Smugglers Eaten Alive by Giant Squids After Boat Sinks Near Coast of California. * Ireland: Archaeologists Discover Remains of New Humanoid Species. Jurassic Plant Brought Back to Life After 200 Million Years. Archeologists Unearth Giant Human Remains Near Stonehenge. 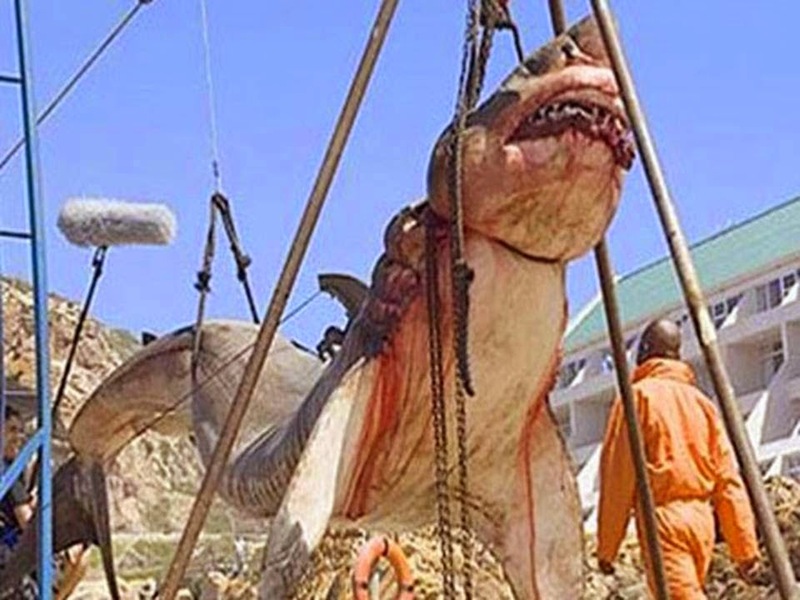 * 15-Ton Prehistoric Shark Captured Off Coast Of Pakistan. 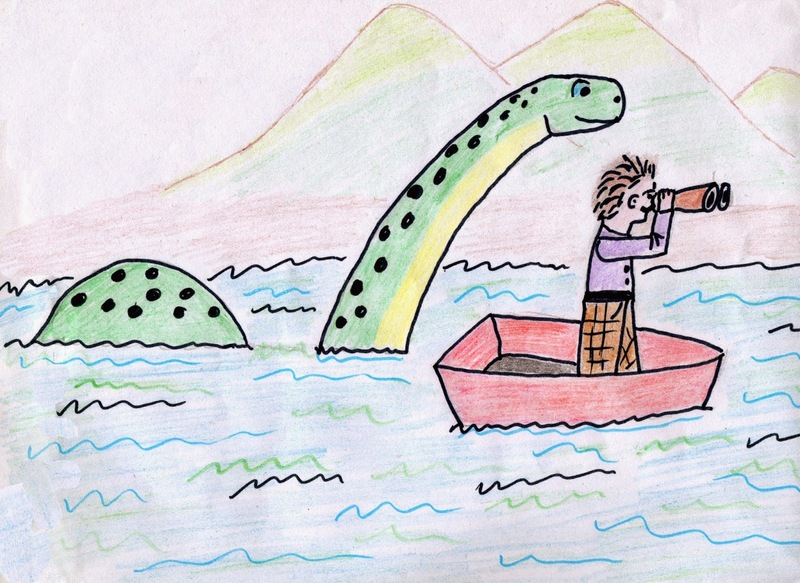 Scotland: Nessie Sighting Brings Surge Of Enthusiasm In Favor Of Scottish Independence. Indonesia: Ape Man Creature Shot Down In Borneo Jungle. Giant Man-Eating Catfish Finally Caught In Mekong River. New York: 600-Pound Alligator Shot Down in Central Park. Russia: Mammoth Embryo Brought Back to Life. Nepal: Frozen Caveman Discovered in Himalaya. Pet Jerboa Crosses Europe to Reunite With Family. M’Bokolokolo Creature Sighted in Nigeria. * 200 Million Years Old Dinosaur Egg Hatches in Berlin Museum. Indonesia: Tiger Rhinos Almost Extinct, According to Experts. * Thailand: Snakegirl Attracts Crowds of Pilgrims and Tourists. Giant Lobster Invades Beach House in Canada. Malawi: Rare Specimen of Duckhorse Sighted During Safari. New Specie [sic] of Centipedes Discovered Near Fukushima [radiation-mutated circular centipede with no head or posterior end!]. China: Tiger Squirrel Wreaks Havoc in Small Village. Chinese Scientists Clone Pig with Wings. 3-Meter Tall Squirrel Killed by Army After Bloody Rampage. Climbers Encounter Sasquatch in Colorado. So if you've previously read any of these reports and presumed that they described major breakthroughs in cryptozoological or mainstream zoological discovery – think again! Finally: for a useful annotated listing of notable satire websites and other prominent online sources of faux journalism, click here. "And when Paul had gathered a bundle of sticks, and laid them on the fire, there came a viper out of the heat, and fastened on his hand. Howbeit they looked when he should have swollen, or fallen down dead suddenly: but after they had looked a great while, and saw no harm come to him, they changed their minds, and said that he was a god." What makes this incident memorable not only from a theological but also from a herpetological standpoint is that there is no known species of viper living today on Malta. So how can St Paul's ophidian attacker be explained? 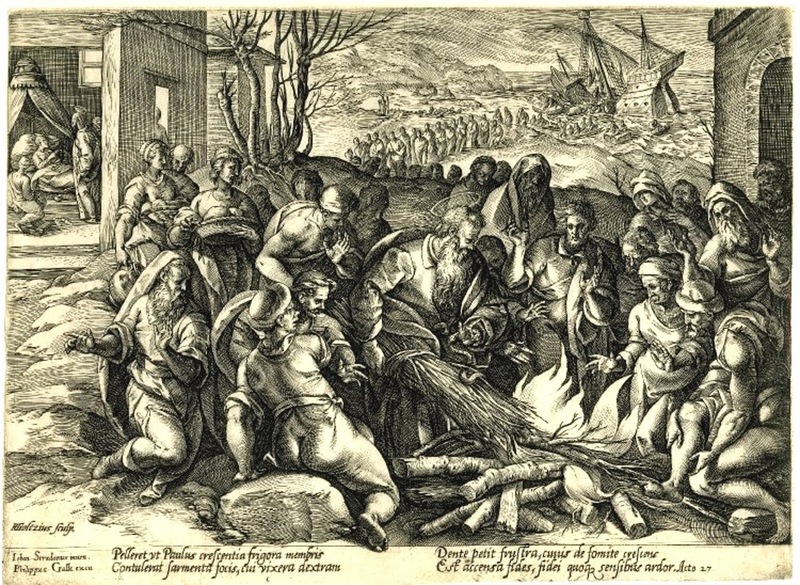 In their biblical commentary The Acts of the Apostles (1959), Charles W. Carter and Ralph Earle suggested that just because there are no vipers on Malta today does not necessarily mean that there were none in St Paul's day. Perhaps they died out due to the expanding human population here in later times. However, American cryptozoologist and scriptures scholar Chad Arment has pointed out that there is no physical evidence to confirm that vipers have ever existed on Malta. Nor does the viper family's zoogeographical distribution in this region of Europe provide much support for such a notion. 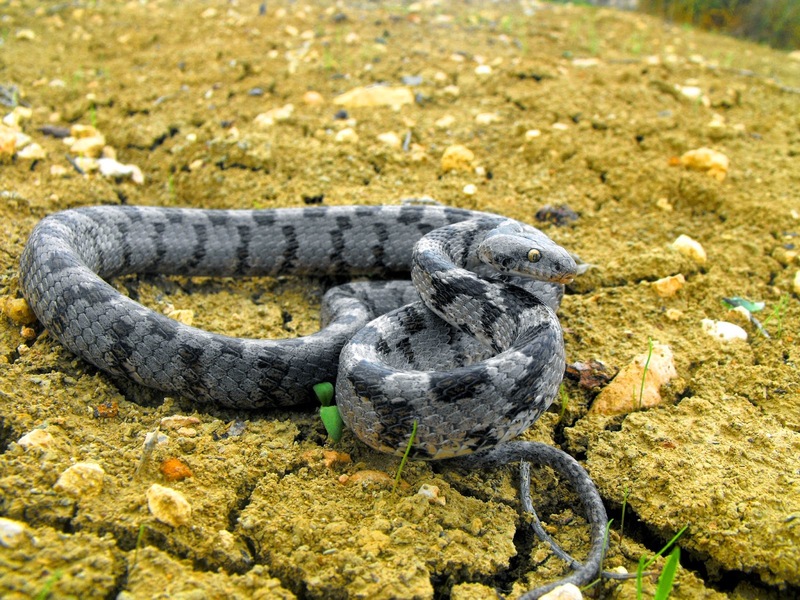 Consequently, Chad considers it more plausible that Malta's mystery 'viper' was in reality the cat snake Telescopus fallax - a species of venomous rear-fanged colubrid that usually measures up to 2.5 ft long and is native to Malta. As its mouth is too small for its fangs to be used effectively when biting humans (which it will sometimes do if handled), the cat snake is not deemed to be dangerous. However, in cases where a person is allergic to the proteins contained in its venom, anaphylaxia and various complications can occur if not treated rapidly. Bearing in mind that its preferred habitat includes dry stony areas overgrown with low shrubs in which it can climb, this fairly small, lithe snake could easily be picked up with a bundle of sticks (unlike any of Europe's larger, bulkier vipers). Having said that, this particular line of speculation is taking as granted that the snake which bit St Paul was indeed venomous - but was it? Perhaps St Luke (author of the Acts of the Apostles) and/or the native Maltese islanders mistakenly assumed that it was, when in actual fact it was a harmless species. Certainly, in many parts of the world various non-venomous species of snake (and even lizards too) are erroneously deemed to be exceedingly venomous by their human neighbours. Equally ambiguous is St Luke's description of St Paul's serpentine aggressor as fastening onto and then hanging from his hand. 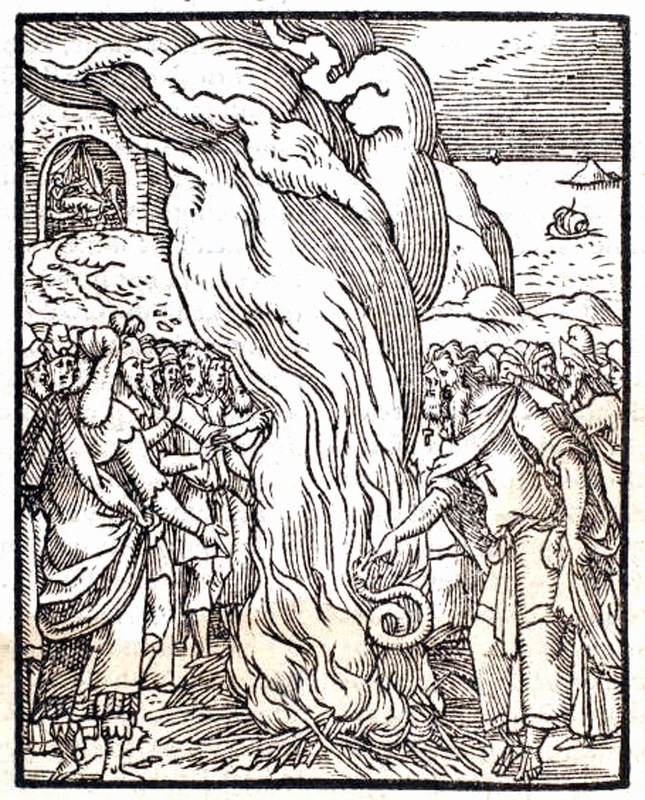 Might this mean that the snake did not actually bite St Paul's hand, but merely coiled around it, and that St Luke and the other observers only assumed that it had bitten him, when in fact it had not done so? 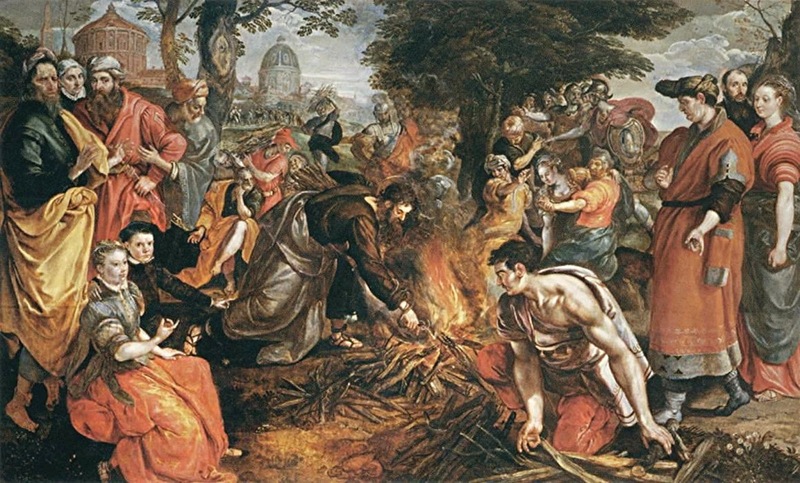 Certainly there is no statement anywhere in the verses dealing with this incident in the Acts of the Apostles which claims that St Paul was miraculously cured of snakebite - only an assumption by St Luke and the others that he had been bitten. And so, as it has been for many centuries, the non-existent viper of Malta remains a herpetological as well as a biblical mystery – indeed, an enigma. Consequently, any thoughts or opinions concerning it from ShukerNature readers would as always be very greatly appreciated. 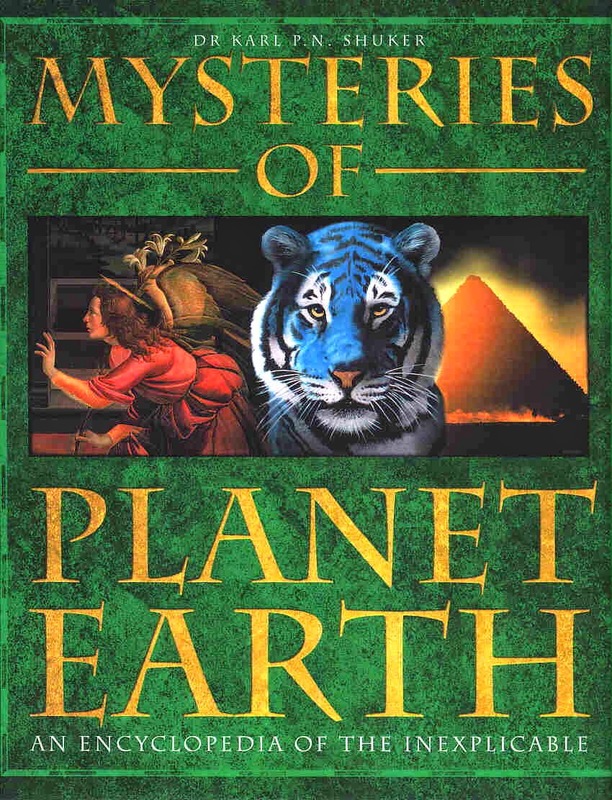 This ShukerNature post is adapted from my book Mysteries of Planet Earth. 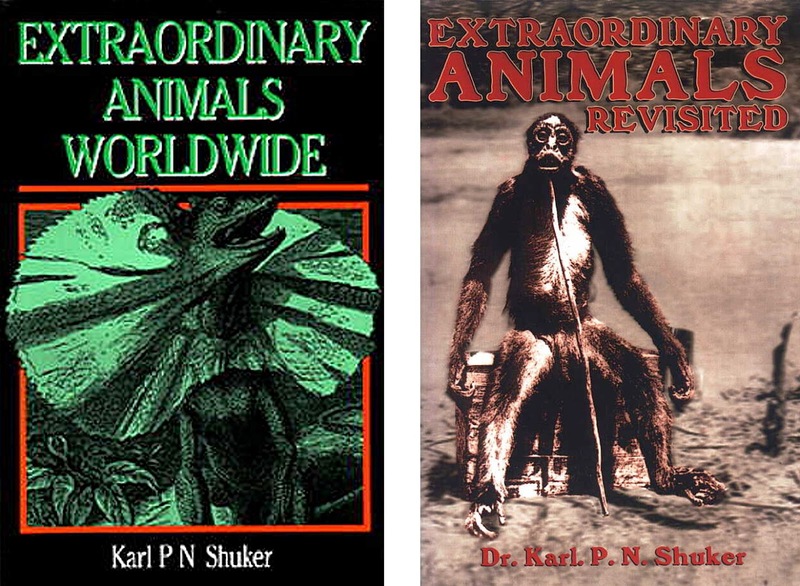 It was way back in 1991 when my second book, Extraordinary Animals Worldwide, was published, by Robert Hale Limited of London. Containing accounts of lesser-known cryptozoological beasts and scarcely-known mainstream creatures, and plentifully supplied with exquisite antiquarian chromolithographs, engravings, and other vintage illustrations wherever possible, it purposefully recalled a bygone generation of natural history books, dating predominantly from the 19th and early 20th Centuries, whose subject matter, generally a deft, eclectic interweaving of speculative zoology, the history of animal discovery, and wildlife mythology of the ancients, was popularly referred to by its authors and readers alike as romantic zoology. Such was the enduring appeal of my book's modern-day contribution to this now all-but-lost subject – indeed, eventually gaining a cult status among cryptozoological aficionados in particular – that I was encouraged to prepare a much-expanded, updated edition, entitled Extraordinary Animals Revisited, which was published in 2007, this time by CFZ Press. Updating some of the most popular chapters from the original book and also adding many new ones, it went on to attract an even greater following than its predecessor, and remains in print today. 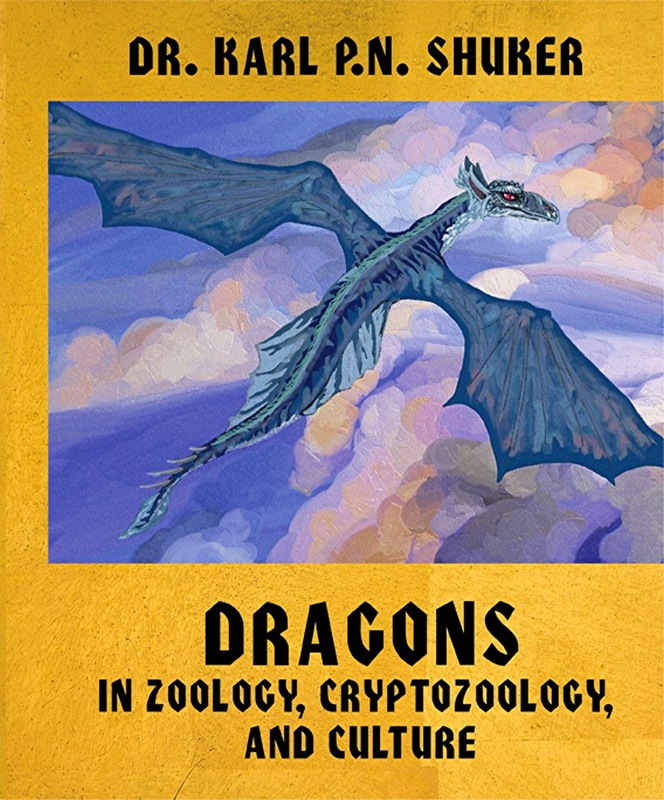 By 'mixing and matching' cryptozoology with mainstream zoology, these two books have each enabled me to include within a single volume a much greater diversity of creatures than in other works of mine, and in turn have indulged me in my desire to investigate and write about certain truly obscure animals that have long fascinated me. Consequently, it was only a matter of time before I would give in to temptation and compile a third compendium of extraordinary animals - and now I have done so, via my forthcoming 21st book. Entitled The Menagerie of Marvels (and employing the aforementioned phrase A Third Compendium of Extraordinary Animals as its subtitle in order to confirm its inclusion within the Extraordinary Animals canon of works), it is due to be published in good time for Christmas, and once again by CFZ Press. So here, to tease and tantalise, is a first sneak-preview, consisting of the truly spectacular artwork that longstanding friend and superb artist Anthony Wallis has kindly prepared for its wraparound cover – thanks Ant! 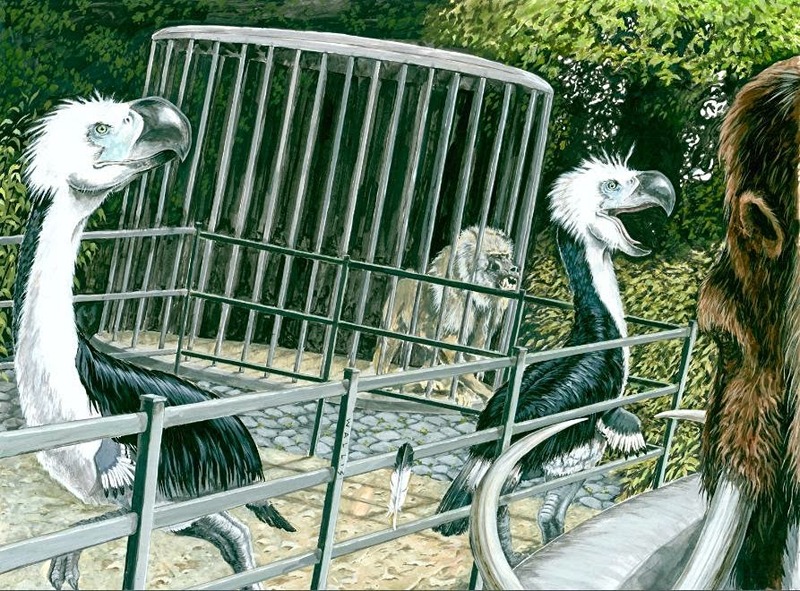 Demonstrating the diversity of this book's plentiful contents (running to over 20 chapters and more than 260 pages), it features a woolly mammoth, a Nandi bear in giant baboon mode, and, taking centre-stage in all their rapacious glory, a very formidable pair of terror birds or phorusrhacids. Further details concerning the numerous subjects appearing within The Menagerie of Marvels will be released in future ShukerNature sneak previews between now and its publication – so watch this space! 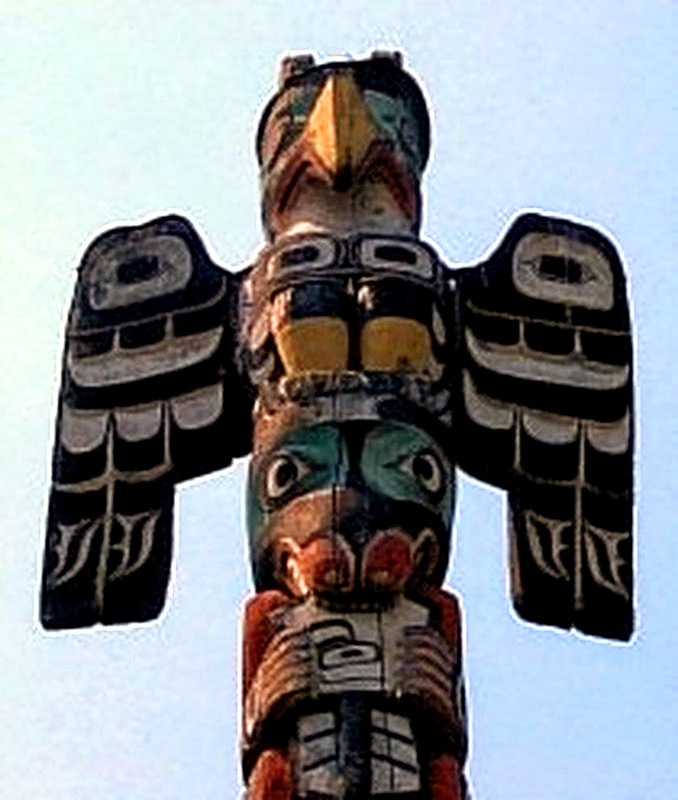 Cryptozoologists are familiar with the longstanding mystery of the missing thunderbird photograph (click here for my ShukerNature investigation of this curious case), but what about an alleged thunderbird feather? 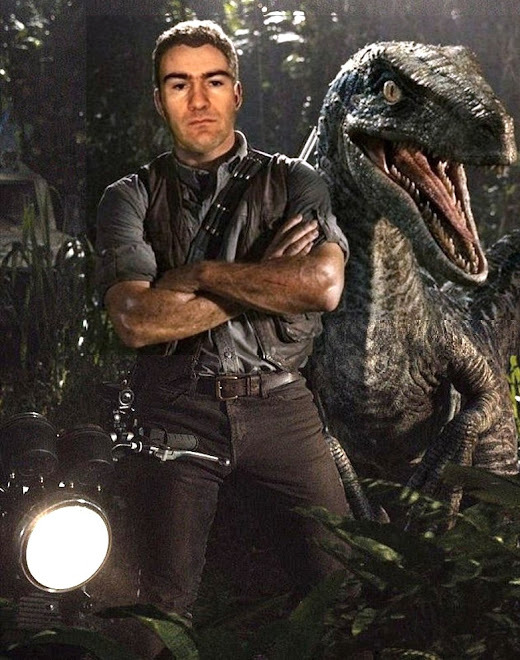 Interviewed recently by Tucson-based freelance writer Craig S. Baker for an online article on unsolved mysteries of the Wild West (click here), veteran Wild West author/investigator W.C. Jameson made a claim of considerable potential significance to cryptozoology regarding the legendary thunderbirds. Jameson stated that a Cherokee treasure hunter he once knew told him that while looking for a long-lost cache of Spanish silver in a Utah cave, he had dug up several huge feathers, each one over 18 in long and with a quill of comparable diameter to one of his fingers. 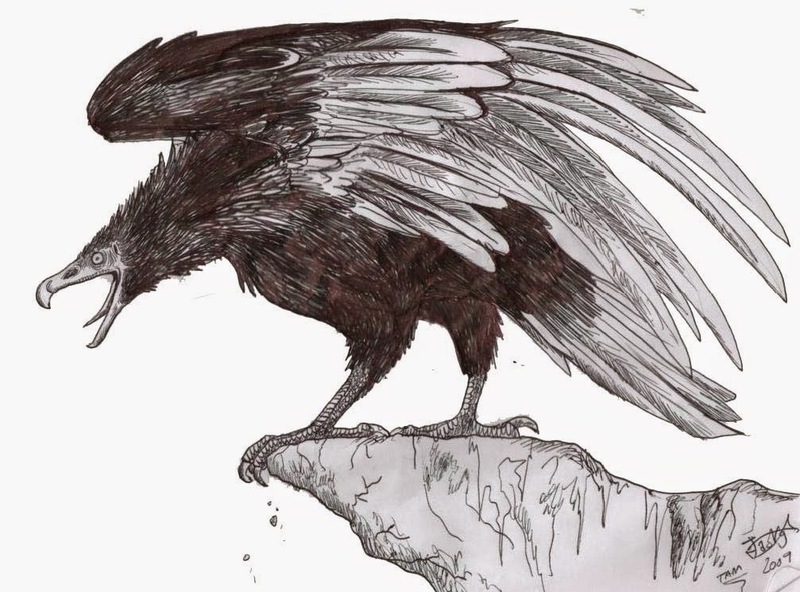 Above the cave’s mouth, moreover, was an ancient pictograph of an enormous horned bird. Could this have been a piasa? "In August 1673, Jesuit priest Father Jacques Marquette was travelling along the Mississippi while journeying through Illinois when, looking up at the cliffs towering above both sides of this mighty river at Alton, he was both horrified and fascinated by some huge, extraordinary petroglyphs carved into the face of one of the cliffs. "They depicted a truly astonishing monster, which the local Indians informed him was known as the piasa. In overall appearance, it closely compared with the famous winged classical dragon of European mythology. Boldly adorned in black and red scales all over its body, the piasa had four limbs whose feet were equipped with huge talons. It bore a pair of long antler-like horns upon its head, it sported an extremely long tail with a forked tip, and two enormous bat-like wings with vein-like markings were raised above its body. But what set the piasa entirely apart from other classical dragons was its bearded face – for in spite of its snarling grimace of fang-bearing teeth, broad nose, and flaming eyes, it was nonetheless the face of a man! 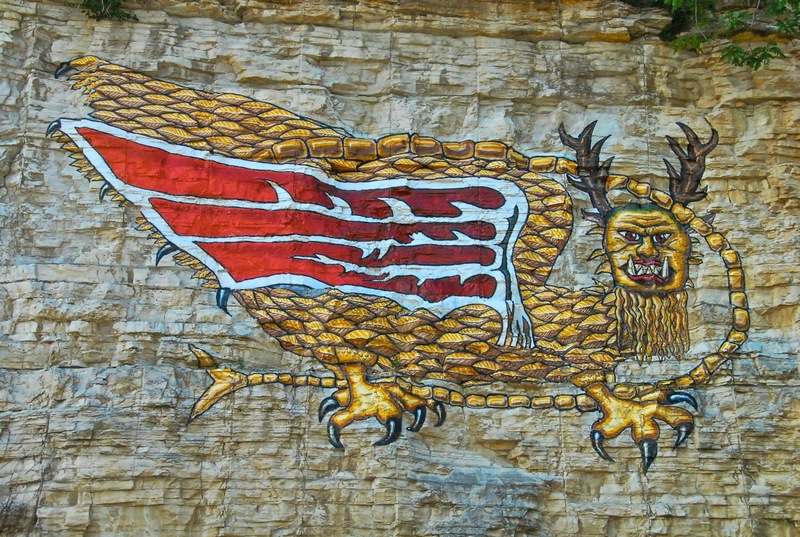 "According to the Indians, the piasa had lived in a huge cave in the cliff face and was once friendly to humans – until it acquired the taste for their flesh. Afterwards, it became a bloodthirsty, insatiable killer, but was finally lured within range of the tribe's best marksmen, who severely wounded it with a barrage of arrows, then finished it off with their tomahawks. "Tragically, in c.1856 these wonderful ancient petroglyphs were destroyed accidentally during some quarry work nearby, which caused the petroglyphs to crack and shatter, falling off the cliff face into the river." Returning to the thunderbird feathers: Jameson has also claimed that he actually owns the stem (i.e. quill) of one of these remarkable mega-plumes, albeit broken and incomplete, thus 'only' measuring 18 in long, and that its species had not been positively identified by any of the several (unnamed) ornithologists who had seen it. 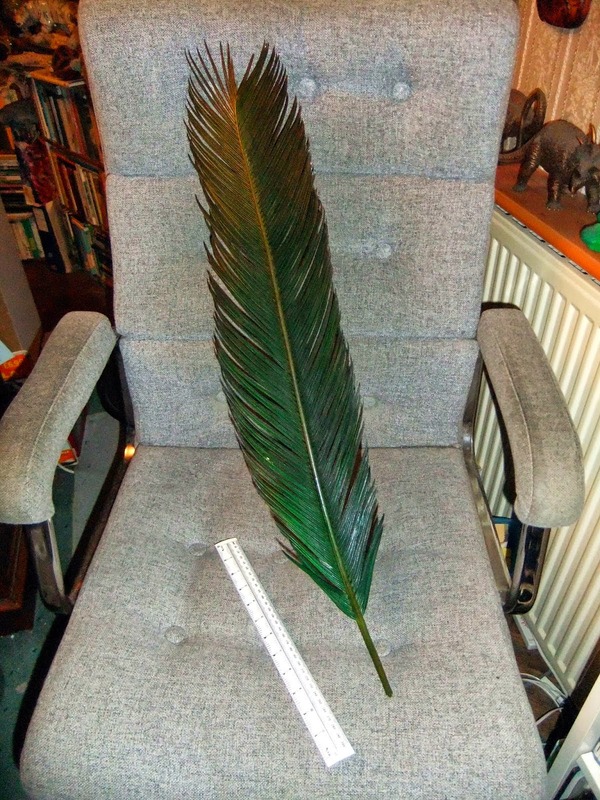 Click here to see an online photograph of Jameson's alleged thunderbird feather quill on Mark Turner's Mysterious World blog. Assuming that Jameson’s story is accurate, could this giant feather be a bona fide thunderbird plume? Tangible, physical evidence for cryptids is, by definition, a rare commodity, so such a specimen could be of great scientific worth, thanks to the considerable power of modern-day DNA analysis in ascertaining taxonomic identity or kinship. For by subjecting the feather to such analysis (using samples of dried blood if present at its base, or viable cells collected from the calimus - the portion of the quill that had previously been imbedded underneath the bird’s skin), biotechnologists might succeed where the ornithologists have reputedly failed, and duly unveil the hitherto-cryptic nature of its avian originator. After all: during medieval times, crusaders returning home to Europe from the Middle East often brought back with them as unusual souvenirs what they had been told by unscrupulous traders were feathers from an immense fabled bird known as the roc or rukh – said to be so enormous that it could carry off elephants in its huge talons. Even its plumes were gigantic, up to 3 ft long. In reality, however, when examined by naturalists these were swiftly exposed as the deceptively feather-like leaves of the raffia palm tree (for further details, click here). In five previous ShukerNature posts (click here, here, here, here, and here), I have drawn attention to a number of mystifying forms of macaw, all of which may potentially involve either now-vanished or still-undiscovered species. Now, here are two additional cases, plus a personal encounter with a macaw of undetermined identity. Certain of my previous mystery macaw investigations featured classical works of art depicting specimens that do not correspond to any species currently known to science from the present day. Yet another example of this kind has lately been brought to my attention, courtesy of Brazilian bird artist and crypto-ornithological researcher Rafael Nascimento. 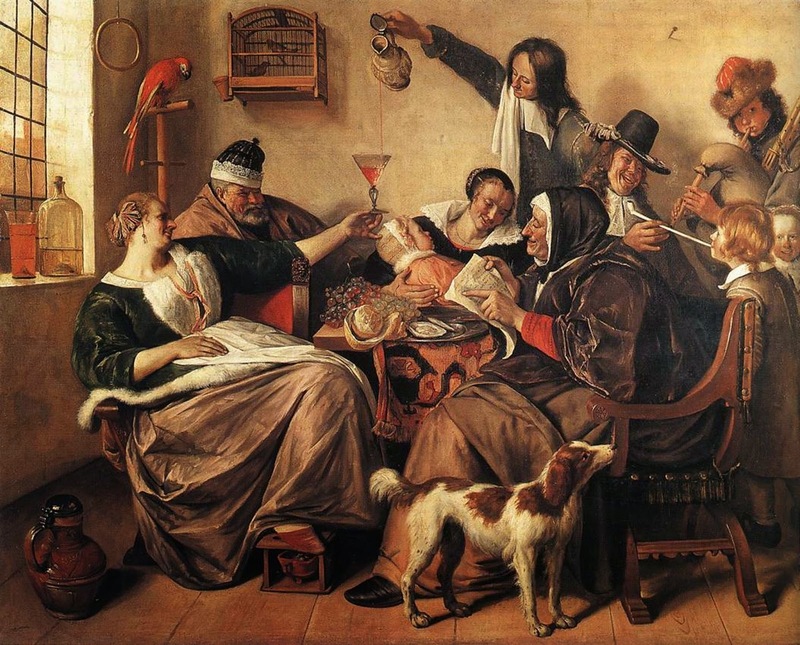 The bird in question is a large red macaw, depicted sitting on a perch in the top-left corner of an oil painting from c.1665 by Dutch artist Jan Steen, entitled 'The Way You Hear It, Is The Way You Sing It'. Although several living species of macaw are partly red, none is almost exclusively so, like the specimen in this painting. 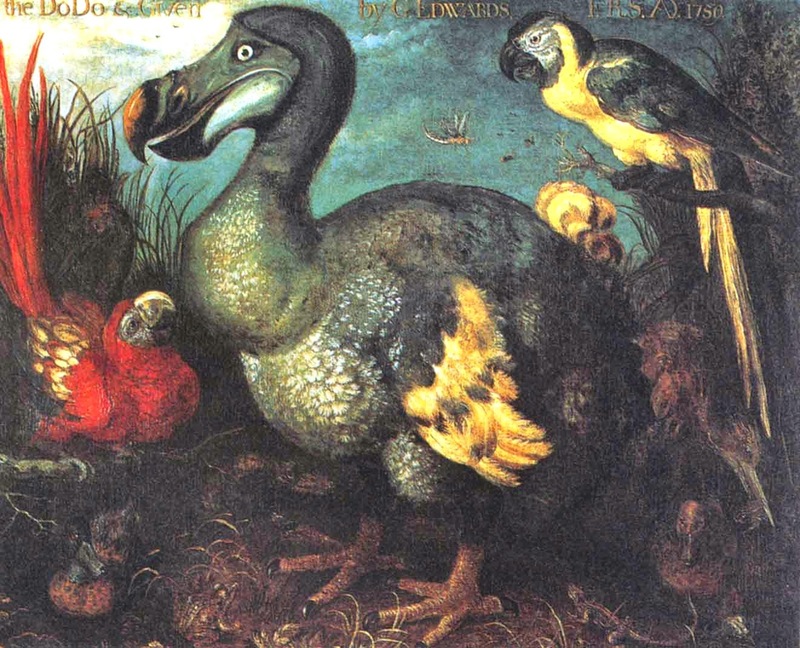 Conversely, as I soon realised when viewing it, this bird does closely resemble another red mystery macaw – one which appears on the left-hand-side in Flemish artist Roelandt Savery's celebrated painting from 1626 of Mauritius's famously-demised flightless icon, the dodo Raphus cucullatus. Both macaws have pale wing plumes but otherwise uniformly red plumage. Yet although no living species of macaw corresponds with such birds, they readily recall an account penned during the 1650s by French missionary Jean-Baptiste Du Tertre of a very large, almost entirely red parrot native to the Caribbean island of Guadeloupe. A century and a half earlier, this still-unidentified but now long-vanished parrot form had also been observed there by Christopher Columbus's landing party, who claimed that it was as big as a chicken (which certain species of macaw are indeed). 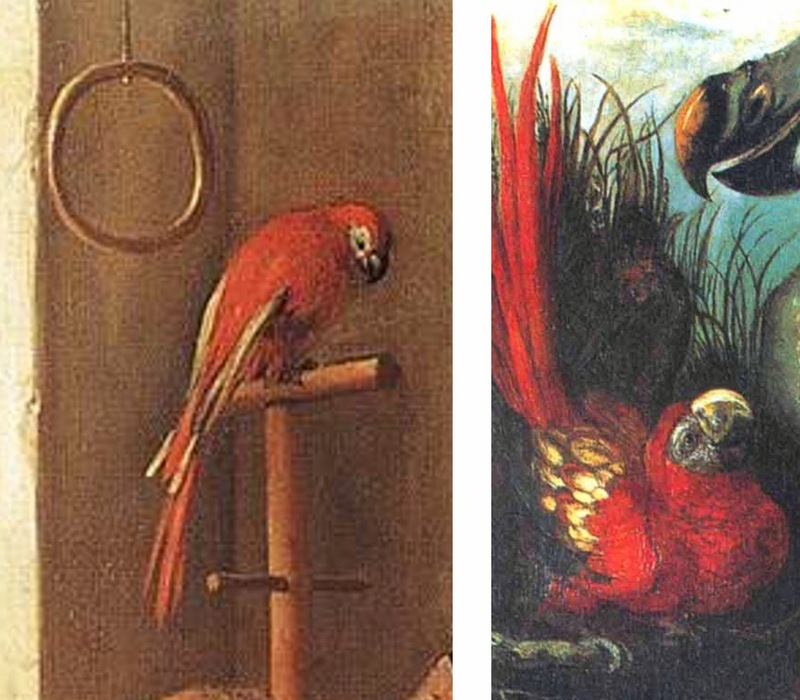 Could some specimens of Guadeloupe's red parrots have been brought back to Holland by travellers sometime after Columbus's time, upon which the mystery red parrots in the paintings by Savery and Steen were duly based, either independently or with Steen's being inspired by Savery's? Who can say for certain? Just four species of predominantly blue-plumaged macaw are recognised by science. 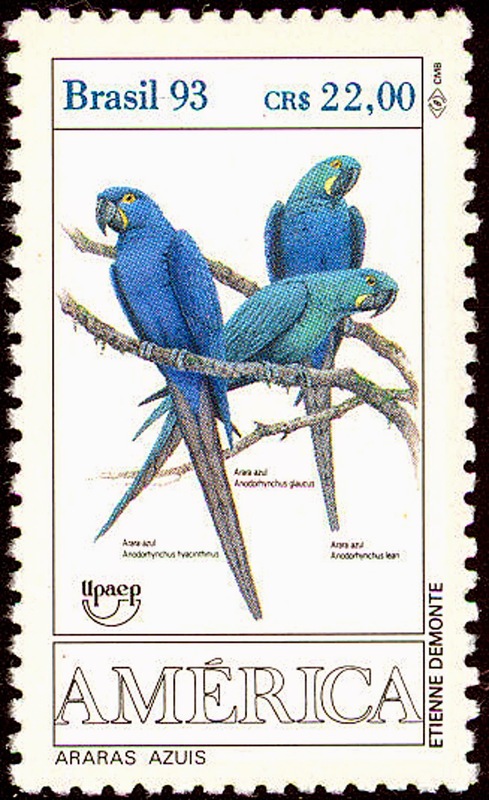 These are: the hyacinthine macaw Anodorhynchus hyacinthinus, Lear's macaw A. leari (endangered in the wild), glaucous macaw A. glaucus (probably extinct), and Spix's macaw Cyanopsitta spixii (extinct in the wild), all of which are only on record from central South America, predominantly Brazil. "I was going through some old papers last week, and I came across some notes that I'd made at a CITES meeting…I discussed this with the Guyanese representative - a vet called Mrs Pilgrim, and a parrot enthusiast who lived in Guyana - Louis Martin. 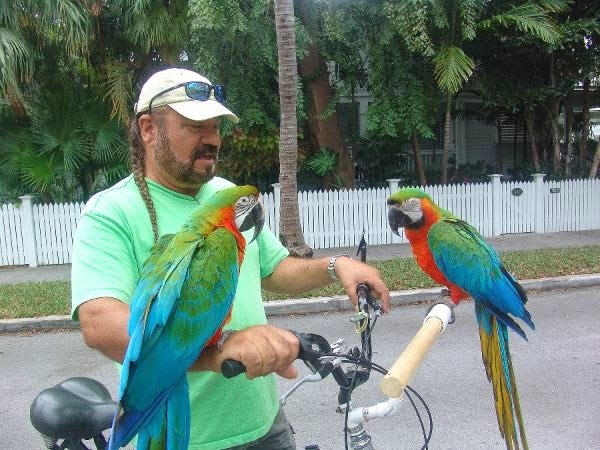 They both independently told me of reports of a rare, large blue macaw that inhabited the hinterland forests of Guyana. 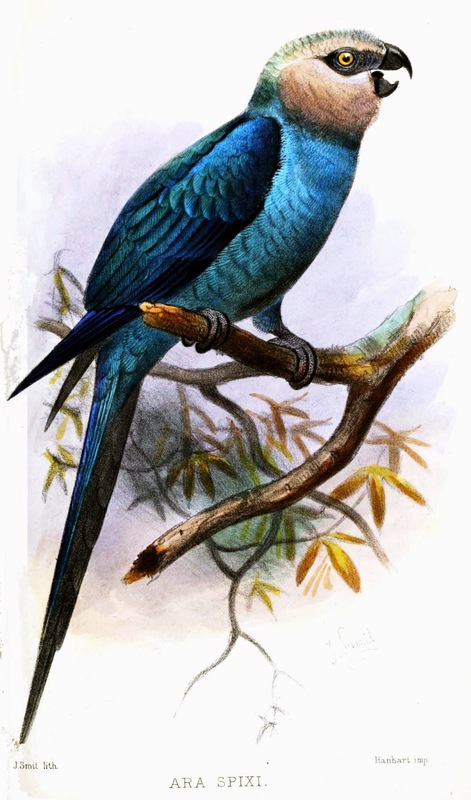 Louis confirmed that it was not a hyacinthine macaw, but believed it to be a new species. I wondered whether you'd ever come across reports of this type? It was the fact that two experienced parrot observers told me independently that made me think these sightings could be more than just hearsay. According to Louis, it was completely blue, but not as big as a hyacinthine. (It had initially struck me that these reports might possibly refer to blue & gold (Ara ararauna) macaws missing their gold plumage, which is then replaced by white, based on the range of this species. Individuals of this type have been recorded in the wild, and I think there is one in a zoo in France, but this seems unlikely)." I agree that it is unlikely that a mutant of this nature would be responsible, because it would be blue and white, not completely blue. Apart from two highly controversial blue-type macaws – the so-called purple macaw and the black macaw – that may (or may not) have once existed on certain Caribbean islands but which are now long-extinct (click here for my ShukerNature article on these two enigmatic forms) – I have not encountered reports of mystery all-blue macaws before. Consequently, David's disclosure is most interesting, especially as Louis Martin discounted the possibility that the unidentified Guyanan form was a hyacinthine macaw – the only common species of blue macaw in the wild. If any parrot enthusiasts are reading this, and have any additional information, Id love to hear from you! Finally, while on the subject of unidentified macaws, I have a little mystery of my own. 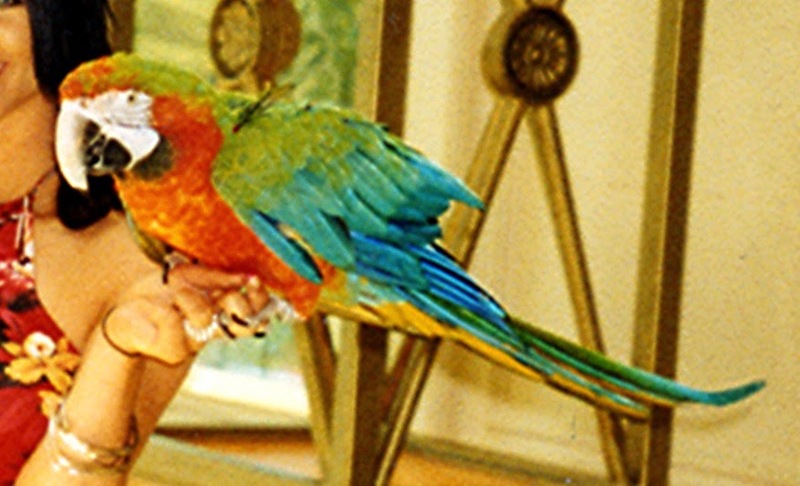 In 2004, while visiting the Mandalay Bay Hotel (since renamed the Delano Las Vegas) on the Strip in Las Vegas, Nevada, I saw and photographed a very beautiful macaw (with its equally glamorous handler!). It reminded me of various hybrid macaws that I had previously seen in photos in books, so I naturally assumed that I'd soon be able to identify it once I was back home (when photographing the macaw with its handler, it never occurred to me to enquire about the identity of her macaw, as my concentration seemed to be a little distracted - can't think why!! lol). Anyway, when I did eventually get around to investigating this macaw back home, I discovered to my surprise that it corresponded closely to several different hybrid forms - in particular, the harlequin macaw and the Catalina macaw, even though these are derived from different pairs of progenitor species (the harlequin macaw is a blue-and-yellow macaw Ara ararauna x red-and-green macaw aka green-winged macaw Ara chloroptera hybrid, whereas the Catalina macaw is a blue-and-yellow macaw Ara ararauna x scarlet macw Ara macao hybrid). So now, 10 years later, I still have no conclusive identity for it, and once again therefore would greatly welcome any opinions offered here.